MyPhone just unveiled its first Android device for the year 2014 and it is under the "Agua" line of smartphones. Introducing the MyPhone Agua Hail, a pocket friendly phablet which is only priced at Php4,598. With that price tag, we really cannot expect a lot from this new MyPhone Agua device like what we see in other Agua devices such as the Iceberg, Iceberg Mini and Vortex. Even the Agua Cyclone has higher specs. But if you are looking for a decent smartphone with a touch of a phablet size device and you only have limited budget, then this is the good candidate. 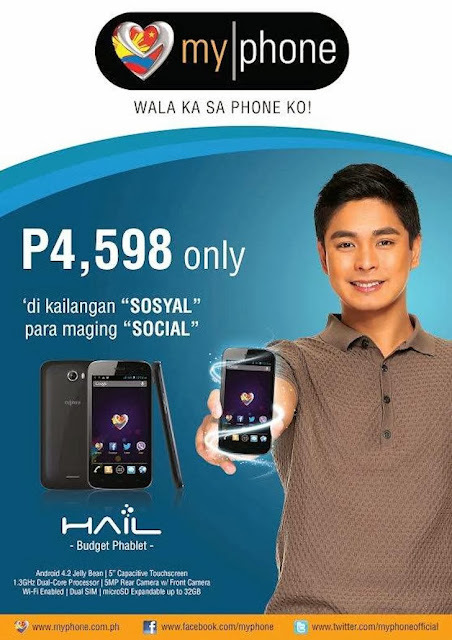 As per MyPhone's post on its Facebook page, the Agua Hail sports a 5-inch Capacitive touchscreen display. Unbox says its resolution is 854x480. Powering the MyPhone Hail is a 1.3GHz Dual-core Mediatek 6572 processor along with a 512MB RAM. This is an Android 4.2 Jellybean smartphone with built-in storage capacity of up to 4GB which is expandable via microSD card up to 32GB. Back and front camera are also present, the rear one will get you a 5MP camera and a VGA front facing one. And then a 2000mAh battery. For connectivity features of course WiFi is not missing, there is also WiFi Hotspot functionality, Bluetooth, GPS and TV-out. Unfortunately, 3G is missing in the scene so if users will try to connect to the online world using cellular connection they have to bear with EDGE/GPRS data connection which is not that practical and not that fast. To me 3G connectivity is something that should not be missing in every smartphone, I would rather add some extra cash and buy a much more upgraded device as internet access if one of my main purposes of buying any using a smartphone.